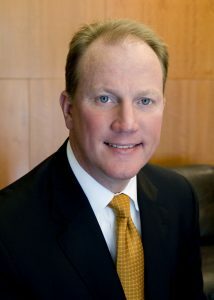 Pat Moon left Arkansas in 1984 a recent finance graduate of the UCA College of Business for an MBA program in Texas. He wondered how his baccalaureate degree and preparation would stack up against his competition from other schools, but ultimately, he was pleasantly surprised. Moon had been exposed to the world of investments as a child when his dad bought him 100 shares of CCX Network, what would one day become Acxiom. Still, he came to the College of Business planning to major in accounting. But when he reached the upper-level classes, he couldn’t ignore the pull to finance and investments. Moon is now a chartered financial analyst with more than 30 years of experience in the industry, including as a portfolio manager and trust investment officer. He has been at Meridian Investment Advisors in Little Rock for more than 20 years as a managing principal. His clientele includes families, endowments, foundations and retirement plans. In the past three decades, Moon has seen many changes to the financial and investment industry. Like most, technology has revolutionized the way things are done. For students entering the field today, Moon said a solid foundation in accounting is key because every investment requires the evaluation of information to make sound decisions for clients. The switch from college to career can be challenging for some or most, but Moon said coming to work with a consistent drive to achieve will help.